On Wednesday April 5, 2017, the Mi’kmaq-Wolastoqey Centre at the University of New Brunswick will host the third annual UNB Powwow, Askomiw (Beyond) 150: Celebration of Resilience, at the Richard J. CURRIE CENTER, UNB Fredericton from 11 a.m. to 4 p.m. This is a free public event, and everyone is invited to attend. 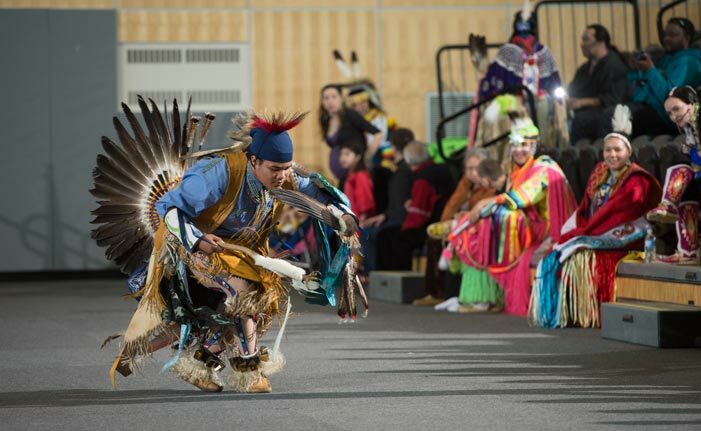 The UNB Powwow celebrates the resiliency of Mi’kmaq, Wolastoqey and Passamaquoddy languages, teachings, traditions, ceremonies, worldviews, knowledge systems and philosophies. These cultural treasures are a source of pride and identity for all Mi’kmaq, Wolastoqey and Passamaquoddy people. The word “askomiw” in the Wolastoqey language means “beyond” or “forever.” The title “Askomiw 150” reinforces a historical fact that Canada sits on the traditional territories of First Nations across the country. The title also states that First Nations will continue to be a presence in Canada as long as the sun shines, the grass grows and the rivers flow. UNB is thrilled to have the Muskrat Singers as our host drum group. The guest drum groups are Spirit Bear and Wabinaki Confederacy; along with two youth groups from Oromocto and Kingsclear First Nations. Our head male and female dancers this year are Craig Isaac (Listuguj First Nation) and Darian Brown (Woodstock First Nation); she is a fourth- year UNB nursing student. Our junior head dancers are Robert Paul (Woodstock First Nation) and Stevie Polchies (St. Mary’s First Nation). At 11:20 a.m., the grand entry will commence, with traditional First Nation drumming, chanting, and dancing in full ceremonial regalia. The grand exit at 4 p.m. will bring the powwow to a close. The public is also encouraged to visit the many First Nation vendors that will be selling traditional art, crafts, and food. If you’re unable to attend, the event will be livestreamed. Like the Mi’kmaq Wolastoqey Centre on Facebook and follow the centre and Elder-In-Residence Imelda Perley on Twitter.